Article first published as TV Review: LOST IN SPACE on Seat42F. Amid a flurry of reboots and revivals, Netflix rolled out a brand-new version of LOST IN SPACE this week. A sort of sci-fi Swiss Family Robinson, the current series, like the original, finds the Robinsons crash-landing on an alien world. With no way off and only so many supplies, they will have to rely on one another and adapt to the environment. Of course, they have the help of Robbie the Robot and must watch out for the nefarious Dr. Smith. The new LOST IN SPACE looks fantastic. That shouldn’t be surprising, as recent television series have been able to make good on special effects, even with a small screen budget. The world looks fantastical, the technology is cool, and Robbie himself is fully CGI-ed. The sequences with the spaceship are stunning, and I had no problem believing the setting as it is shown. The story is, as it should be, focused on family dynamics. In this iteration, flashbacks are used to show us the Robinsons were far from perfectly happy prior to events. Father John (Toby Stephens, Black Sails), often away on military missions, was well on the way to divorce with his brilliant wife, Maureen (Molly Parker, House of Cards), who was tired of keeping the home running without him. Elder daughter Judy (Taylor Russell, Falling Skies) was totally devoted to the clan, even willing to give up escaping a dying Earth if her little brother, Will (Maxwell Jenkins, Sense8), couldn’t go, too. But that left middle child Penny (Mina Sundwall, Maggie’s Plan) unsure of her own place. This is more nuanced and interesting than the original. LOST IN SPACE lacks the cheese it was previously known for, and instead attempts a more ambitious, modern narrative. This is extended to the supporting players, including a faux Dr. Smith (Parker Posey, A Mighty Wind) whose intentions are kept hidden from the audience and other characters. And by keeping it focused on the family, viewers only get things outside the scope of their experience in tidbits, leaving a lot of questions to be answered in small spurts over a longer period of time. Most of these adjustments are good and needed, but where it feels a little weird is in Robbie the Robot himself. By the end of the first hour, we’ve met Robbie, but there are some pretty big questions surrounding him that make him hard to trust. This adds some uncertainty and threat, and yet it’s hard to believe any LOST IN SPACE would not make it turn out all right. Given Robbie’s pop-culture status, it seems odd to treat him this way. It also makes his uttering of the iconic catchphrase feel forced and jarringly out of place, especially as he doesn’t say much before or after. It seems unlikely that any member of the Robinson clan will die even though they are surrounded by things that are trying to kill them. That doesn’t gel all that well with the complex serial story. (Individual episodes have some procedural plot, but there is definitely an important ongoing element.) Audiences of this kind of show are used to there being some sort of cost or sacrifice over time, and LOST IN SPACE doesn’t really make room for that in sticking with the family framework. The result of all this is something pleasant and entertaining, but lacking the teeth needed to make it a fully realized and compelling story. It’s pretty good television, not great television. Which would have been fine ten years ago, but may leave it struggling to find a passionate fan base in this day and age. 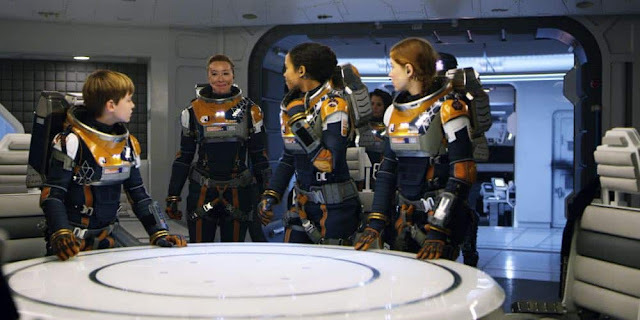 LOST IN SPACE’s ten episode first season is available now on Netflix.